At the Petit 5 kid cafe. It’s the beginning of monsoon season in Seoul, during which it rains nearly every day for an entire month. That means the kiddos need indoor activities. 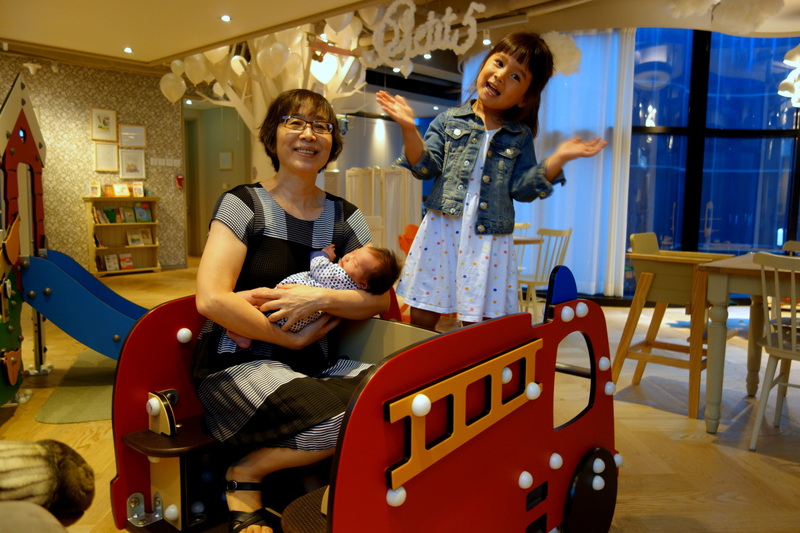 Luckily, Seoul has plenty of “kid cafes” for children to play and enjoy themselves while parents can have an uninterrupted coffee. Oma, Momma and the Hu-Stiles girls chose Petit 5 in our neighborhood for lunches of BLTs and bento boxes and lots of play time. Eva wanted Isa to ride with her in a fire truck, so Isa had to go along, cause she doesn’t really have a lot of free will right now.